Pesto sauce recipes can be made using a variety of leafy greens. These 3 tasty spring pesto recipes are made with simple, wholesome ingredients. All of the pesto recipes are gluten free with a vegan option. 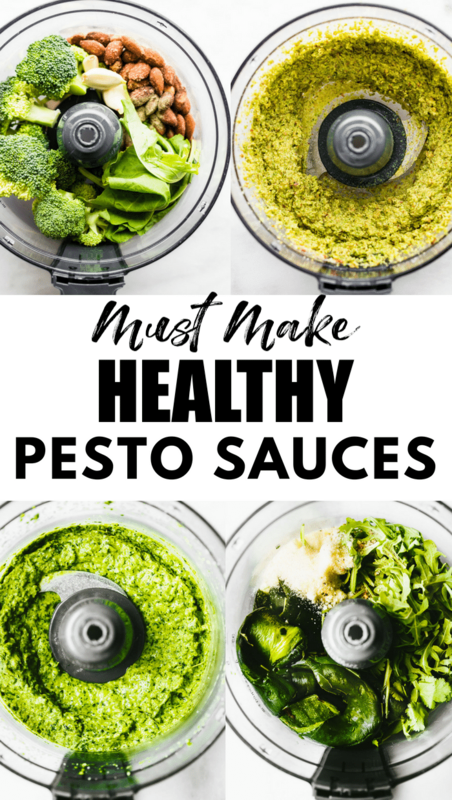 Pesto sauce can be served over spiralized veggies, gluten free pasta, or a fresh vegetables salad to make a delicious spring meal. Hello my name is Lindsay and I am a bonafide pesto addict. Per mentioned before in this zoodle post. Ya, it’s a superfood in my book! Think of it as superfood greens, just concentrated. LOL! In all seriousness guys, these Spring or Summer pesto recipes are a favorite and a must! You see, even though the weather in Utah is CRAZY – I have my tank tops ready for 80F weather, but also have my winter coat ready for a hard freeze. Yep, it totally snowed yesterday. What the what?! Anyways, I still crave foods that are fresh, light, and bright. And pesto falls in that category. 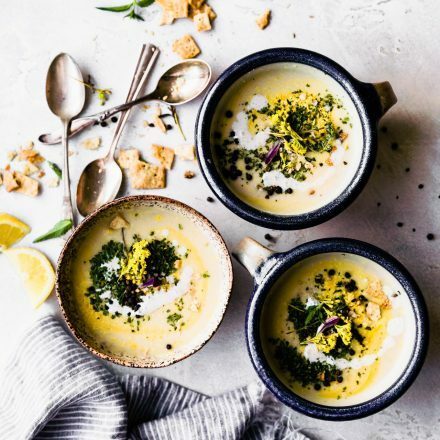 Nourishment for the Spring and Summer Soul, ya know? So let’s ditch the heavy winter comfort food (just for now) and put some FRESH springy ingredients on our plates. You in? Okay, good, ‘cause I know you’ll LOVE the 3 herb-alicious and veggies packed pesto sauces I’ve got for you! I may be bias. Okay and let’s throw in a bonus GREEN pepper–> POBLANO! Am I allowed to play favorites? When it comes to pesto sauce, YES! I’m head over heels for this dill pesto sauce. Drizzle it on warm baby potatoes and it’ll change your life! You think I’m exaggerating, but no. Dill is not typically used for pesto, but OH MY, your pesto is missing out without this tasty herb! 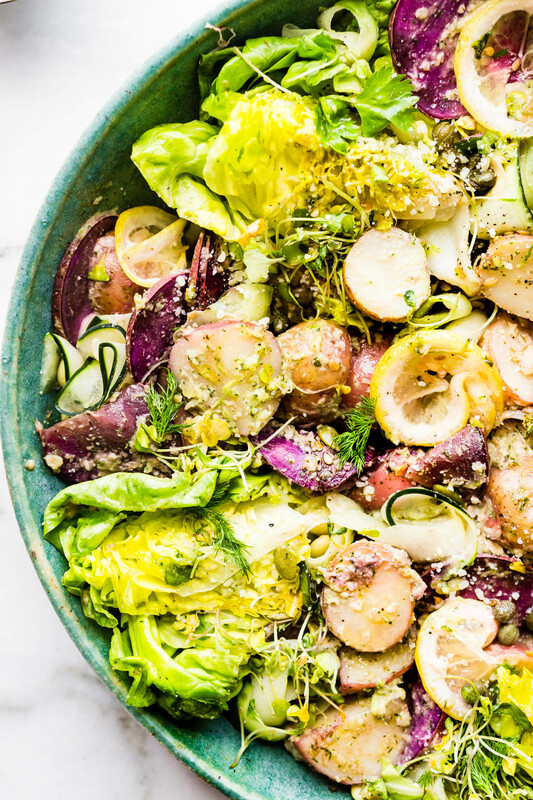 I’ve paired this AMAZING pesto with a medley of potatoes and wedge lettuce for a spectacular side dish, bbq extra, or healthy lunch. 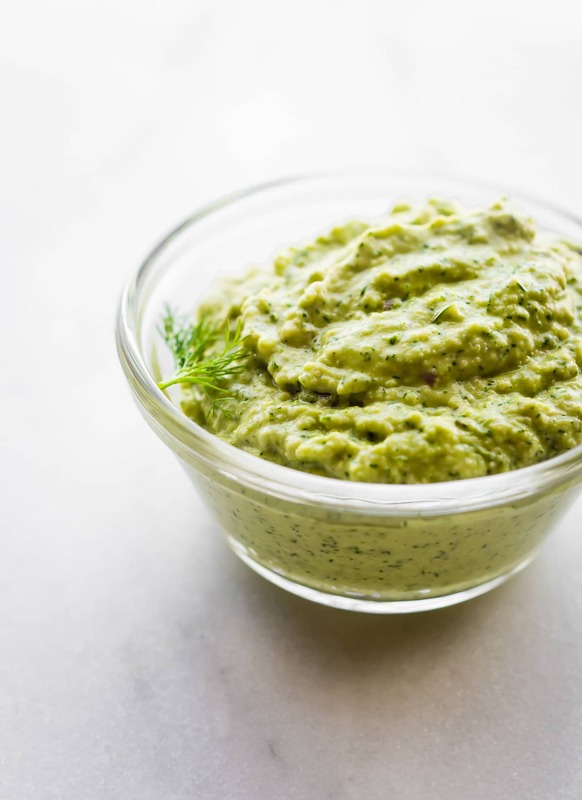 A zippy dill pesto sauce for Spring or Summer. 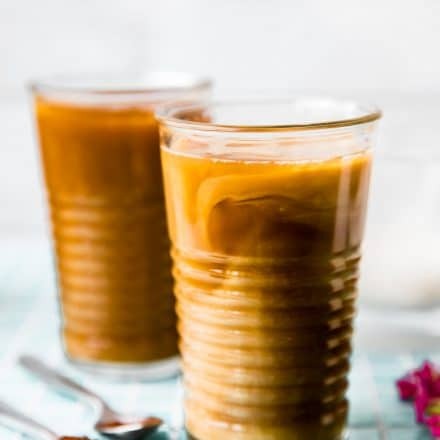 It’s gluten free, paleo/vegan friendly, and super easy to make. 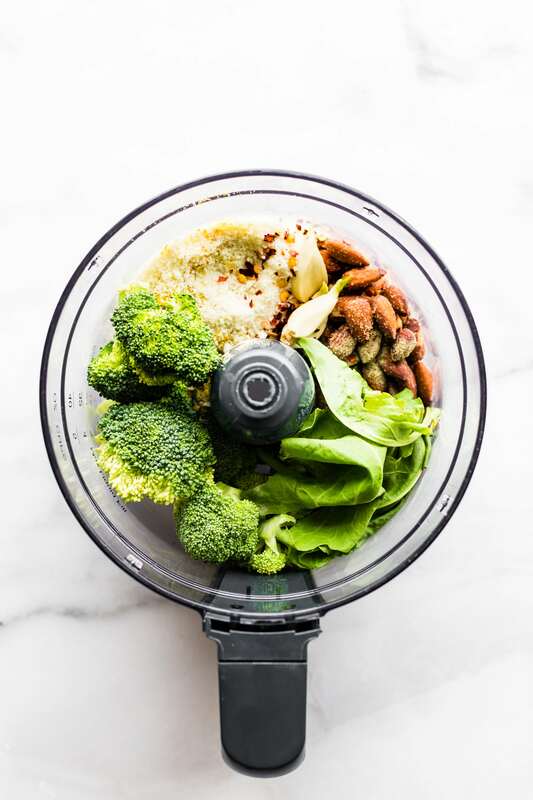 Place dill (stems included), raw cashews, garlic cloves, onion/shallot, cumin, mustard, and lemon juice in a food processor. Pulse until mixed. You might have to scrape down the sides. Add your oil last and salt and pepper to taste. Blend again until smooth. Might take a few minutes to get there. Save a few pieces of dill to garnish. 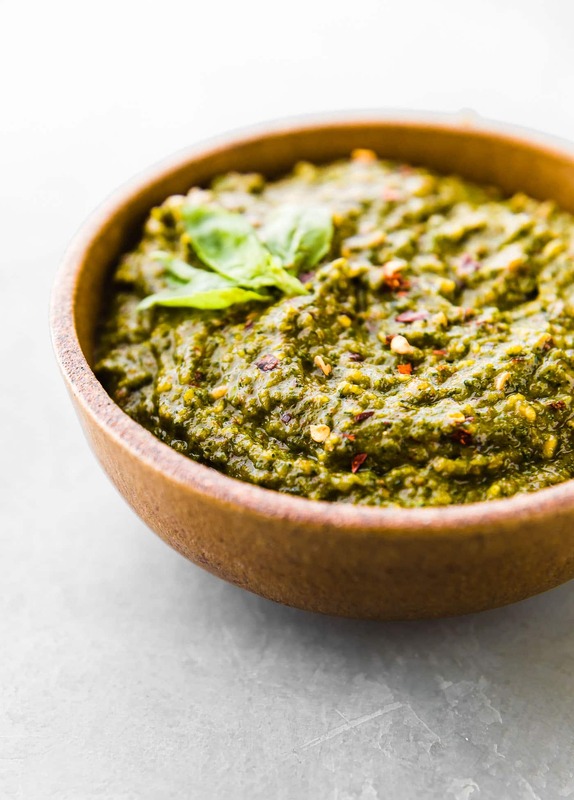 Next up I’ve got a Broccoli Arugula pesto that’s perfect as a spring or summer transition meal. 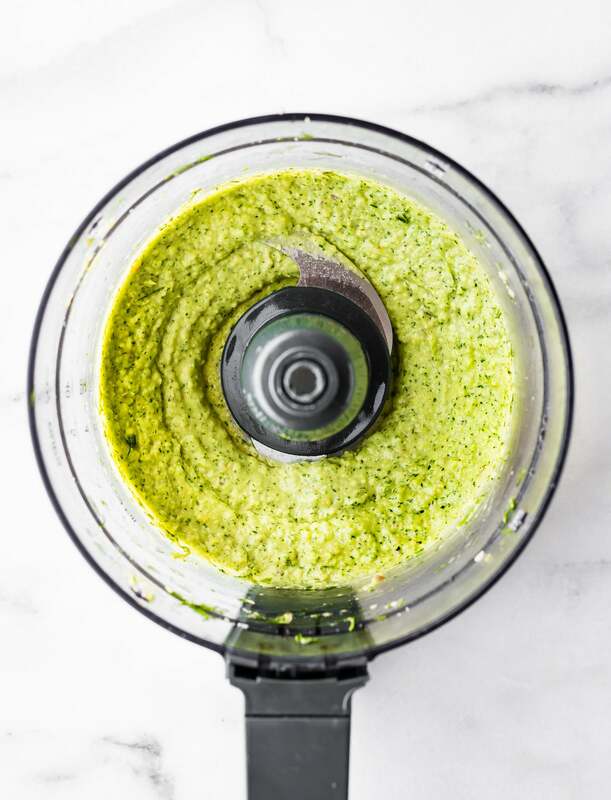 Arugula adds a zippy, peppery flavor that, Gah, makes this pesto so good! Not to be confused with rocket, which is the same green as arugula if you reside in NZ! 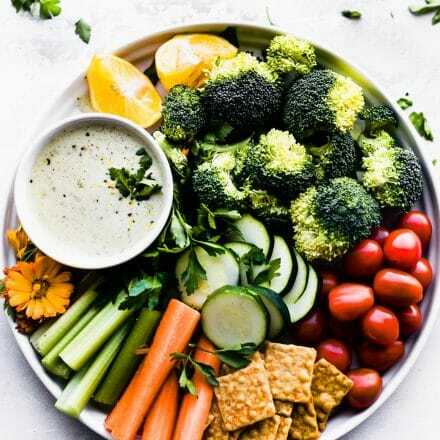 By the time you devour a bowl of this amazing goodness, topped with cherry tomatoes, broccoli sprouts, and, you guessed it, more broccoli, you’ll be loaded with all kinds of good for you antioxidants! 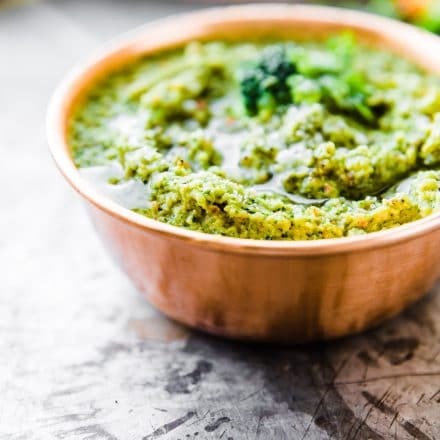 Peppery Broccoli Arugula Pesto packed with nutrition and flavor! Vegan friendly. Add in your almonds, nutritional yeast (or grated parmesan), seasonings, and arugula . Blend and pulse again until all is mixed. Squeeze the lemon evenly around the blended pesto. Then close the lid, except for the the top hole, and place food processor on low. Slowly add in oil while food processor is going. Stop and scrape sides if needed. Pulse until smooth. 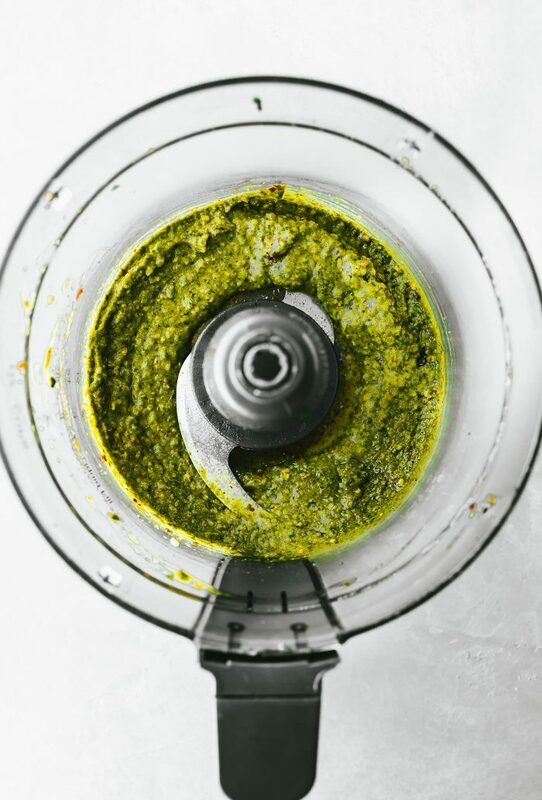 If you want thinner pesto, add more oil or a touch water. Adjust salt/pepper to taste if needed. This recipe will make almost 2 cups of pesto. 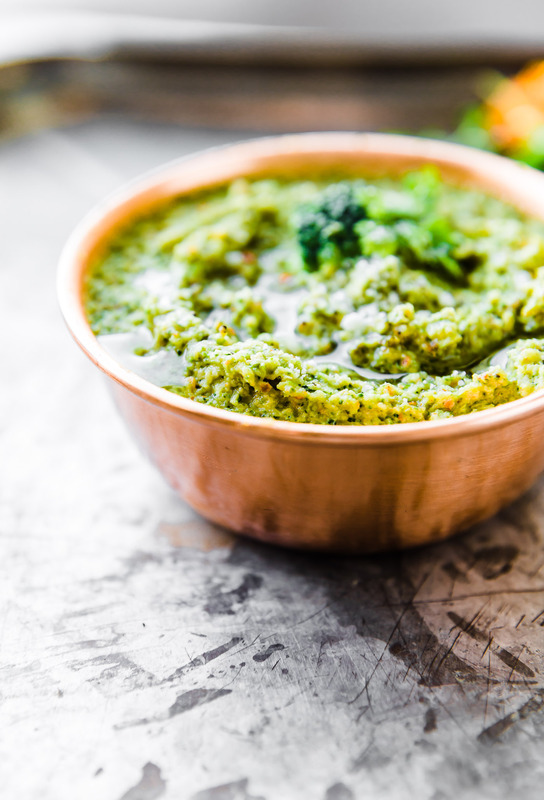 And one more tasty pesto that you’re going to LOVE…ready? 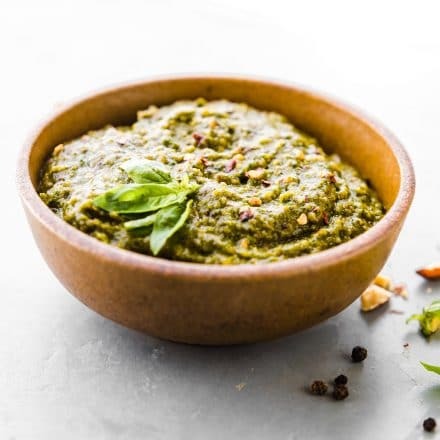 Asian basil pesto sauce. This one calls for Thai basil, but use regular if your market doesn’t carry the Thai variety. A bit of tahini is added for a creamy texture that keeps it vegan, along with some nuts and as many chili pepper flakes as your taste buds can handle. 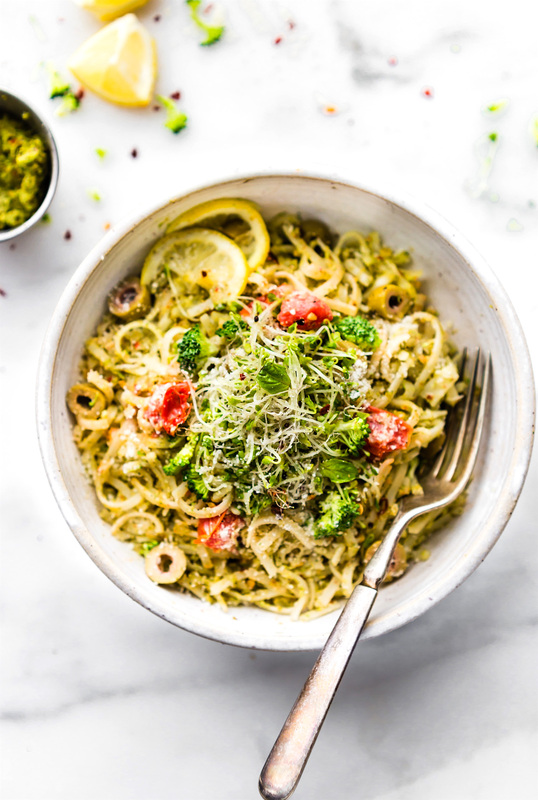 My favorite way to showcase this spicy pesto is in a chicken noodle bowl, and no, not the chicken soup kind! Although that PHO SURE is delicious too. Haha! Actually, I”ll be sharing that recipe next week, so don’t you worry. 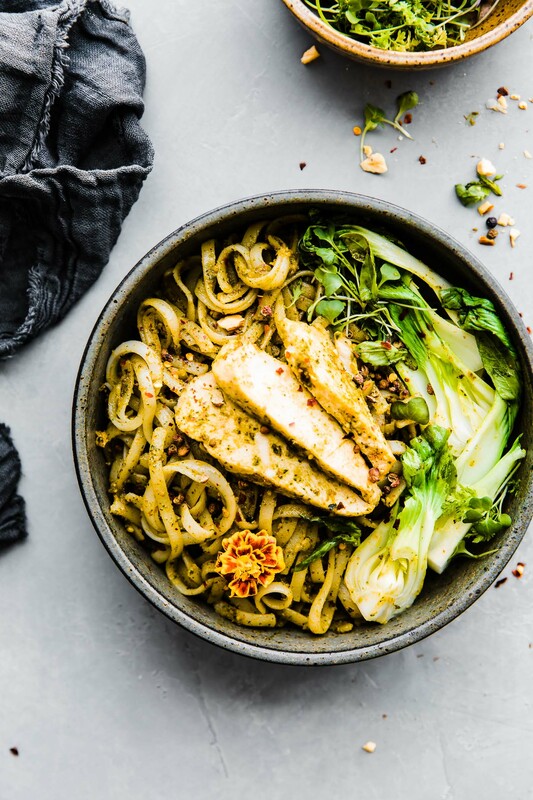 All you do is start with gluten free Asian noodles, rice noodles work perfectly here, add in Asian-infused chicken, and mix it up with this incredible Asian pesto. Total YUM! This recipe uses Thai basil, but use regular if your market doesn’t carry the Thai variety. 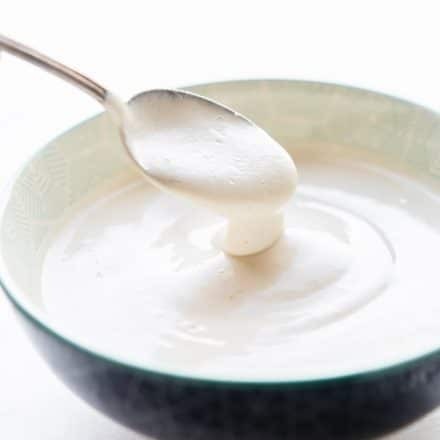 A bit of tahini is added for a creamy texture that keeps it vegan, along with some nuts and as many chili pepper flakes as your taste buds can handle. 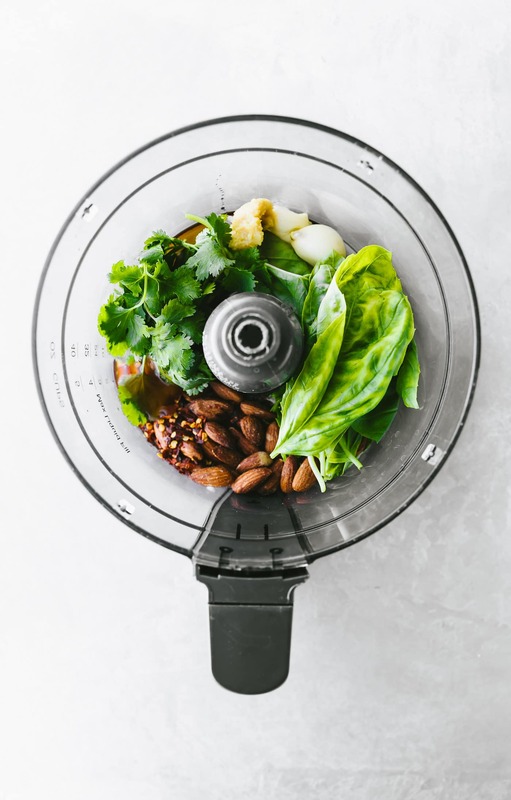 Place your almonds, herbs, garlic, and tamari sauce in a food processor . Blend and pulse again until all is mixed. Next add your rice wine vinegar, sugar, and the grated ginger. Then close the lid, except for the the top hole, and place food processor on low. Slowly add in the sesame oil while food processor is going. Stop and scrape sides if needed. Pulse until smooth. Add your optional sweet chili sauce (Asian sauce) for more spice or thinner pesto. Blend again. Taste and adjust salt/pepper to taste if needed. This recipe will make almost 2.5 cups of pesto. 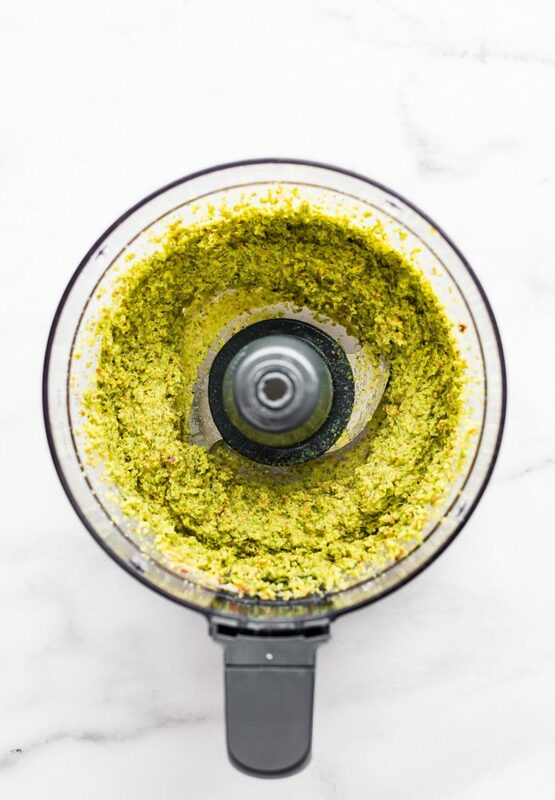 I dare you to change up your pesto routine with these three delicious takes on pesto. Perfect for your spring menu, get some light, fresh flavors on the table, mmmk? Ooh, the Asian basil pesto looks glorious! I have always loved Thai sweet chili basil dishes, so I cannot imagine this tasting peculiar. Also, I love the vegan alternatives here! Since I can only have vegan pesto, my opportunities for trying more pesto is quite limited. However, I did try vegan pesto in a pasta dish once and fell in love, so I, of course, have to start making my own! What marvelous options! I’m starting with the dill version, but I’d love them all!!! Team pesto over here. I’m all about that pesto life. Cashews are a brilliant choice. yep, you and me both baby! AHHH I LOVE all pesto!!!! 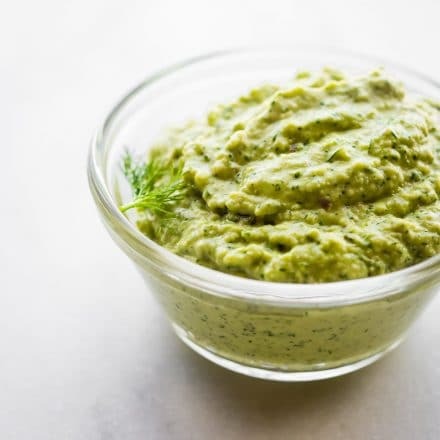 I never would have thought to use dill, broccoli, or tahini paste! I’m going to have to give these a try, yum!!! So thought of you and all your goodness in your garden! I’m having a moment with dill…so excited to try it in a pesto recipe!!! They all look amazing; so creative! I never think to use dill! I love all the greenness in this bowl. Side note: Kiwi’s insta stories were great. I love that he’s redeeming himself after the trashy pop-tart. LOL! Pesto is always such a nice, fresh component to a meal. I have to try these out! Pesto is just the best-o! See what I did there? These all look so tasty!! Omg there’s nothing like pesto in the spring! I make it so much! And these? And GF?! I’m so making these!!! These look fantastic! the recipe for dill pesto asks for 1/2 cashews. Is that 1/2 cup? oops that is 1/2 cup. I will fix it. Thanks! I only really recently starting using pesto but I LOVE it! Can’t wait to try these versions out on my family! There’s no such thing as too much pesto, right?! Great, this is what i looking for. Lindsay, I made your dill pesto for the 4th of July and served it with some crispy potatoes!!! It was soooo gooood! I wouldn’t have thought to use dill in a pesto but I am now converted lol! I will keep making dill pesto as long as my dill plant keeps growing this summer lol! Thanks for the recipe! Hi, I am leaving a comment again so that I could leave a 5 star rating haha! oh emily! you are too kind, thank you!! !